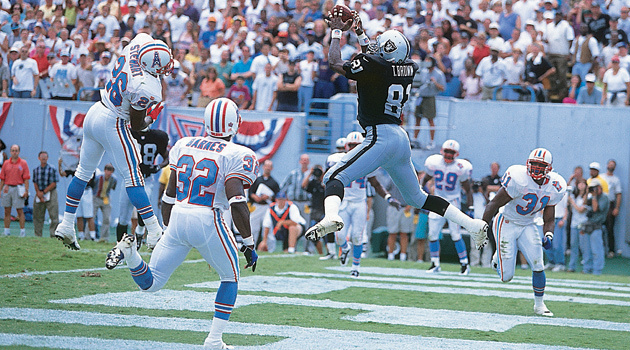 Sports Illustrated honors Pro Football Hall of Fame inductee Tim Brown with this 1998 story. Brown enters the Hall as one of the NFL's all-time great receivers. Tim Brown played 16 of his 17 seasons with the Raiders and finished with 1,094 receptions, 14,934 yards and 100 touchdowns in his career. He will be inducted in the Pro Football Hall of Fame on Saturday. This story originally appeared in the July 6, 1998 edition of Sports Illustrated. Subscribe to SI here. Brown had the option of voiding the remaining years on his contract. In February, however, after careful reflection, he decided to stick with the team for which he has gained 8,588 receiving yards and played his entire 10-year NFL career. "To leave after last season, I would have felt like a dog leaving a fight with his tail between his legs," Brown says. Despite the lobbying by his star receiver, Davis hired as his new coach the Philadelphia Eagles' offensive coordinator, 34-year-old wunderkind Jon Gruden, who graciously dismisses Brown's backing of Shell as a non-issue. Citing his coaching experiences with the Eagles and the Green Bay Packers, Gruden says, “Wherever I've been, the flanker's been my best buddy. In Green Bay it was Sterling Sharpe, in Philly it was Irving Fryar.” After three minicamps Brown is sold on Gruden, or “Groo,” as he is wont to call him over the phone, as in, “Yo, Groo, what's going on?” During minicamp Brown was encouraged by Gruden's hands-on teaching of the club's new offense. The system bears a suspicious resemblance to the West Coast offense, though none of the Raiders would dare to so dub it, considering the scheme's association with their loathed cross-Bay rivals, the San Francisco 49ers. Brown is speaking inside a trailer—a Starwagon, to be precise—across from Lot 21 at Universal Studios in Burbank, Calif. Brown and some other NFL players were there last week to shoot a candy bar commercial set up by Players Inc., the licensing and marketing arm of the NFL Players Association. He is gazing at a TV between takes when the Starwagon becomes markedly more crowded. “What's up, Timmy?” says 243-pound Pittsburgh Steelers running back Jerome Bettis, entering, then making himself at home in the trailer of his fellow Golden Domer. The conversation turns to the curious way the Raiders have always used Brown. “I was just trying to see if you were wearing a lot of makeup or if you were a natural beauty,” he explains. Big Chet's instincts were true. “We're definitely soulmates, that's what's so awesome,” says Sherice. They have settled comfortably into an in-season routine. Upon returning from practice, Tim logs onto his computer, skims an on-line newspaper and answers E-mail sent to him from his company's Dallas headquarters. The company, Pro Moves International, sells licensed women's sleepwear and loungewear, and is licensed to sell NFL- and NHL-labeled intimate apparel. While Brown will assume a more hands-on role with Pro Moves when he retires from football, he and Sherice are thinking of attending law school someday. Whence their interest in law? “It's reality,” says Tim, explaining why he's attracted to the courtroom broadcasts. Sherice nods in agreement. At first she disapproved of Tim's habit. In time, she found herself tuning in to Court TV after he had left the house. Court TV triggers some of their liveliest exchanges. Take the case the channel billed as the Sexual Obsession Murder Trial. Despite persuasive forensic evidence to the contrary, Sherice refused to believe that the defendant, a 17-year-old boy, was guilty of killing the mother of one of his friends. To see the Browns together is to be assured that no Court TV-related difference of opinion could threaten their bond. As we leave them, they are entwined on a love seat ... watching a trial. They are holding hands, and the thought occurs that each holds, in the other, a great catch.